Build A Bigger, Better Chest With Isometrics! An isometric is simply a muscle contraction in which there's no movement, like what happens when you push against a wall. In this workout, you push your hands against each other to contract the muscle, but there's no movement. Done at the tail end of a set, it'll most certainly boost the pump in your chest. When doing incline presses, Wittrock does a high-incline chest flex in which he brings his hands together above his chest, pushing them against each other. With machine bench presses for the middle pecs, his arms are directly out in front of him, which he calls a mid-chest isometric chest flex. And with decline presses, he brings them together near his navel, similar to a most-muscular pose. After he finishes a set of decline presses, Wittrock squeezes his hands together 10 times to focus on the lower pecs. The last isometric hold lasts 10 seconds. Experience has taught Wittrock that not only is squeezing the target muscle with isometrics important, but so is the protocol. In each instance, he recommends nine short pulses with about 75 percent effort followed by a final all-out isometric squeeze for a full 10 seconds. (He counts that as 10 reps total.) That last one, he says, should leave you "shaking like a leaf." But Wittrock relies on more than just standard exercises and unique isometric holds to build a champion chest. He likes to ensure maximal growth with finishing "shocker sets" that include dropsets, negative reps, and static holds. Take your first exercise, the incline dumbbell press, as an example: You do the first working set with 10-12 reps, then up the weight and hit 6-8 reps. After you fail at 6-8 reps, you do a "shocker" dropset in which you immediately reduce the poundage by about 50 percent and continue on with as many reps as you can do. The combination of the isometric and shocker dropsets is a one-two punch that'll magnify the pump in all regions of your chest, but Wittrock also likes negative reps to finish off the occasional exercise. A negative (or eccentric) rep is one in which you take about four seconds to lower the bar, then your partner helps you easily lift it back to the top. It'll leave your muscles screaming. As if those moves weren't enough to finish you off, Wittrock also includes a bodyweight superset at the end of the session that will ensure you're fully tapped. One final note before launching into the workout: It may go without saying, but if you want to give yourself every opportunity to grow, don't forget about pre- and post-workout nutrition. A solid pre-workout supplement will help you give your all in the gym, branched-chain amino acids (BCAAs) provide a great source of mid-workout energy, and post-workout protein will help kick-start muscle recovery and repair. 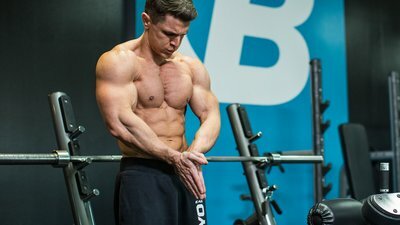 If you think you've got what it takes, here's a brief summary of how you should approach each exercise in Wittrock's isometric chest workout. Do 1 warm-up set of 15-20 reps.
Do 1 set of 10-12 reps to failure, immediately followed by isometric holds for the upper pecs, bringing your hands together above your chest. Do 9 reps at 75 percent effort and 1 all-out rep that lasts 10 seconds. Increase the weight, perform 6-8 reps to failure, and then immediately drop the weight by about 50 percent for a dropset to failure. Do 1 warm-up of 15-20 reps.
Do 1 set of 10-12 reps to failure, immediately followed by isometric holds for the middle pecs, bringing your hands together directly in front of you. Do 9 reps at 75 percent effort and 1 all-out rep that lasts 10 seconds. Use a machine press with a neutral grip. If your gym doesn't have one, use a wide, overhand grip. This can also be done with a barbell or dumbbells on a flat bench so long as you follow the same protocol. Do 1 set of 10-12 reps to failure, immediately followed by isometric holds for the lower pecs, bringing your hands together near your navel. Do 9 reps at 75 percent effort and 1 all-out rep that lasts 10 seconds. Increase the weight, perform 6-8 reps to failure, and do 3 negative reps with the help of a spotter. Control the eccentric (lowering) phase for a count of four. If you don't have a spotter, do a dropset here like you did on the first two exercises. Do 1 set of 10-12 reps to failure, then immediately drop into the halfway position of a push-up and hold it isometrically for as long as you can. Increase the weight, perform 6-8 reps to failure, and immediately drop the weight by about 50 percent for a dropset to failure. Do just 1 set of as many reps as possible (AMRAP) doing bodyweight dips for chest (make sure you lean forward to better target the pecs), then dropping to the floor and completing as many push-ups as possible.